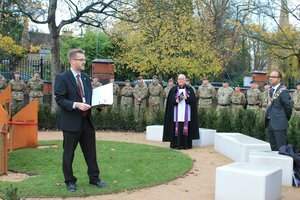 South Swindon Parish Council is very proud to report the unveiling of the new war memorial in GWR Park on Saturday 10 November 2018 at 3.00pm. The war memorial is to commemorate the centenary of the end of World War 1. The site of GWR Park was selected as an appropriate setting and the north west corner of the park is where the sun goes down. 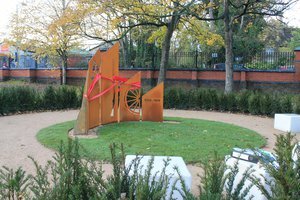 The war memorial was designed by local artist, Dr Mike Pringle and depicts different aspects of the First World War. 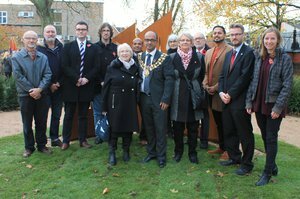 The Chair of the Parish Council, Cllr Chris Watts carried out the unveiling with Cllr Junab Ali, Mayor of Swindon and also a Parish Councillor and they were assisted by 2 Wiltshire Army Cadets.